Top 20 Burgers with the most Calories. Stay healthy- Avoid these top 20 burgers! Have you ever wondered, why you have never been able to resist those cheesy double burgers? According to research, the fats and sugars in these foods can actually alter the biochemistry of the brain in a fashion similar to the changes that take place, when someone is addicted to heroin and cocaine. If you are craving a juicy patty with all the trimmings teamed with a thick shake and fries dredged in salt and ketchup (the add-ons are too much excess baggage on one plate for one person), then this article is will tell you where to go. However, if you are looking for a way to avoid clogged arteries and a fast track journey towards being overweight and plain unhealthy, this list is definitely worth browsing! 20. 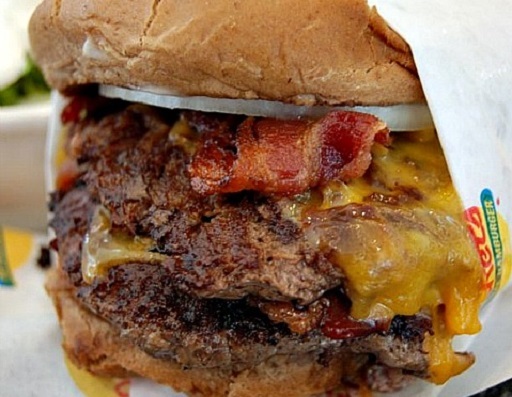 In-N-Out Burger’s Double Double Cheeseburger is 670 calories (Two pure American beef patties and two cheese slices). Serving size is 330g. The calories mentioned above don’t include what’s in the shakes / sodas and cheesy fries. Add those to the mix, and a delicious treat goes from a treat to a health hazard! For example, Dairy Queen’s Large Malted Peanut Butter Milkshake contains 1,350 calories, 650 of those of from fat. The Jack in the Box Oreo Cookie Ice Cream Shake (24 ounces) contains 1,170 Calories. And a Burger King Triple Whopper Large Meal that comes with a side of large fries and a large soda weighs in at a ridiculous 2,100 calories with 104 grams of fat. Johnny Rocket’s Bacon and Cheddar double Cheeseburger with the dubious title of Americas greasiest calorie bomb available at major chains. Enjoy!